Welcome to the E.A.D. Designs weekly Monday hop! You should have arrived at my blog from Amy T.'s blog, if not, please start the hop at the E.A.D. Designs blog! The hop officially starts off at the E.A.D. Designs blog at 10:00 a.m..
As this is the first hop of a new month, today's hop theme is GRADUATION! My card for today uses the super fun E.A.D. Designs Congrats Stickerz set. 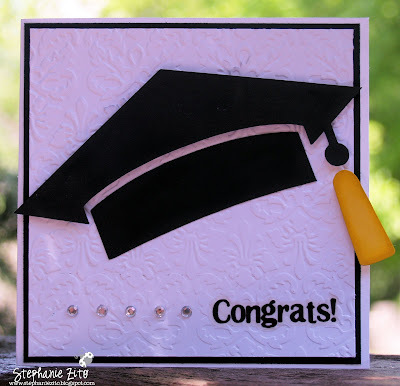 The grad cap was cut from cardstock on my Silhouette Digital craft cutter. Extra products used: SU cs, Distress inks, Cuttlebug embossing folder and u/k gems. Your next stop on the hop is the wonderful Amy C! And, don't forget to check out this month's monthly steal! 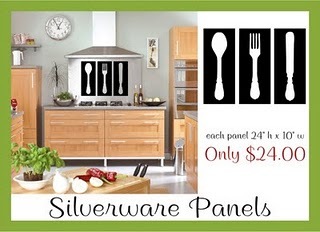 Wouldn't these look fabulous in your kitchen?!!! Such a great card...love the pop! Here from the blog hop... Have a happy Monday! Very lovely card, great job! This is so cute! I love the embossing. so simple and elegant!! :) Love it! I'm getting giddy seeing all these graduation cards- I graduate in two weeks! Great card--I really like the cap you made. Beautiful colour and embossing. So simple and stunning.